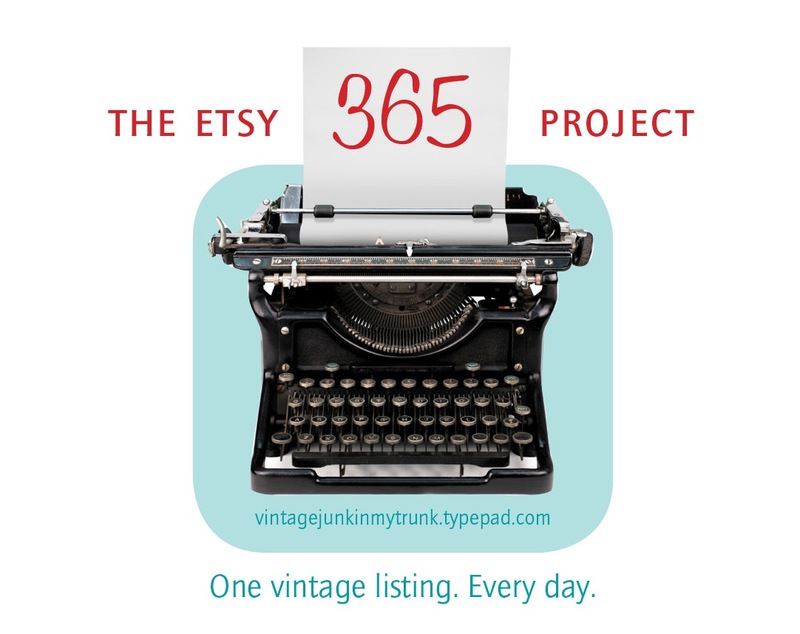 As you may have guessed by now (especially if you see my Facebook updates), I'm continuing my listing streak with The Etsy 365 Project in some form or another. I don't know if I have another 365 days in me, but maybe I can break it down into more manageable, bite-size pieces. Maybe 90-day increments? That will get me through the lean winter months and just before yard sale season hits. Some days were harder than others. There were plenty of times the hours would get away from me and it would be 11:30pm with no listing. On those days, I KNOW if there had not been a public announcement (and expectation!) of a listing I would NOT have posted anything. "Oh, I'll just do it tomorrow". And you know how that goes. So having that commitment be a public thing was definitely important. Summer vacation was an especially difficult time. We were gone for almost a week junking in Bouckville, with an unprecedented week at the beach both before and after with only a pitstop home in between. I needed to have almost 3 weeks of listings ready to go every day. That was hard. The holidays were also difficult, mainly because I was trying to list my Christmas items into my Christmas shop, and those listings wouldn't count as part of my Etsy 365 Project. Add in all the other holiday stuff, and that was really tough too. My first listing of The Etsy 365 Project (2013); sold three months later. This challenge is for 90 days. I will probably reup after that 90 days expires, and then maybe I'll take the summer off. We'll see how it goes. My first listing of the Christmas Countdown Challenge 2013; as yet unsold. I actually listed 505 new items during my 2013 challenges (365 in my regular shop + 140 in my Christmas shop), plus relisted many items (those figures are not available from Etsy). How did that translate sales-wise? Here are the stats. My genius boy helped me with the percentages (click on image to enlarge) but this is by no means scientifically accurate -- some variables are missing. But it gives you an idea of how it worked for me if you're thinking of giving it a try. Comparing the numbers from 2012 and from 2013 in my Vintage Junk shop, the views increased by 88%, the favorites increased by 300%, and, most importantly, the sales increased by 66%! 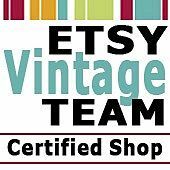 In a little over four months, my new Vintage Christmas shop had 40% of the views my three year old Vintage Junk shop had in all of 2012, 110% of the number of favorites, and 52% of the sales! I'm not really sure what it all means. All I know is I sold more this year than I did last year. A lot more. So I'm going to keep going. If you're thinking of giving a project like this a try, here are some tips that worked for me. Make it public. Knowing I HAD to list -- since I was both posting it weekly on my blog and daily on Facebook -- made it happen. Picture this. I took as many photos of as many items on nice bright days as I could. Then I could edit them late at night or whenever, and always had some on my computer for that last minute listing. Copy and paste. I didn't have many similar items, but if you do, it is easier to make one listing and then copy it and change it accordingly. I still have boxes of sewing patterns I hope to be able to use this technique on. Stock up. If you find yourself with the time to do more than one listing a day, continue to make those additional listings and save them as drafts. You will be so grateful on those days when it's 11:30pm and you haven't listed yet. Or the kids are sick. Or you're sick. Or you have a work deadline. Or when all of those things happen at once! So who's with me this year? Anne of Kitschy Vintage is doing it! Who else has made the commitment? This may have been the most difficult week of The Etsy 365 Project. With all of the holiday preparations going on, I really struggled for the time to list, and I didn't want to list any Christmas items in my regular shop. This red and green tablecloth would be perfect for the holidays, without any holiday icons. … and other paper ephemera. Although I had plenty of Christmas items photographed and ready to go, there was simply no time to do it all. So this week the Christmas Countdown is completely empty! Which I'm ok with, as I am at listing #133 and met my Christmas Countdown 119 challenge. The Etsy 365 Project -- Week Fifty! Looks like green was my theme this week -- just in time for the holidays! I reluctantly listed this teal green metal tape measure from the late 1800s and it sold likethat! The third reluctant listing. This cute little green stool is painted with chalkboard paint on the top for all of your holiday messages. Sigh. These items weren't green but the props in the photo were. Set of antique German tin molds. An antique wedding dress on yet another dress form (I need to stop collecting these). The dress has been on this form forever, but I never really cared for it. The dress, not the form. So it's selling, along with the provenance -- attached is a letter from the woman who made it for her wedding in 1917. 345 Antique Tape Measure Green Metal Fabric 1800s SOLD! More green! And another reluctant listing. I love the antique teardrop shaped ornaments best of all. The pink are my favorite, although these green are gorgeous! This Italian glass angel was found in a pile of junky Christmas stuff. I really didn't think much of it until my research discovered that they are selling for upwards of $30 on ebay. Sold in days, so don't overlook those hidden gems! Mr. VJIMT found this for me the other day at an indoor flea market. Another hidden gem; it is made in Germany. The head and hands are wax, and the wings are real feathers! Another big seller on ebay. 128. Vintage Angel Blown Glass Italy Ornament SOLD! Caught up! And only two more weeks to go in The Etsy 365 Project! This is one of my favorite pedestal cake plates because of the sweet doggie image -- I think it's some kind of a pointer? Anyway, I haven't really listed any of these on Etsy, but figured this one needed a broader audience to find its rightful owner. So on to The Etsy 365 Project it goes! I thought about keeping this necklace and earring set for myself, especially for a holiday outfit, but it is little too short for my tastes. Love the color though! Speaking of color, I couldn't believe my eyes when I found this bright and vibrant tablecloth at a flea market. It was just tossed on a table, and amazingly, only has a small dirt smudge on it. And the original manufacturer sticker. I love these boxes of old thread. Not sure why; I'm not much of a seamstress. This was a piece of an old framed mirror that had seen better days. We salvaged the top part. It sold fast! Here's another excavator that came from my son's room. Even though it's missing its rubber on the wheels and the chain on the crane, it also sold within days of listing. 343. Vintage Architectural Salvage Wood White Shabby SOLD! 344. Vintage Tonka Orange State Hi-Way Dept Crane SOLD! I was able to list lots of Christmas items this week -- lIke this set of glittery Putz houses, made in Czechoslovakia. These little flocked birds are so sweet! A choirboy ornament from Japan. I think this sequined ornament represents the dancing Cossacks in the Nutcracker. What do you think? 122. Vintage Christmas Angel Tree Topper Gold Japan SOLD! I'm still a couple of weeks behind on the recaps, but should be all caught up by the end of this week. These December listings seem to be the hardest, what with all the other holiday things going on. At some point I will need to go shopping -- somewhere other than flea markets! I found this antique "A Christmas Carol" book last year but never listed it. This edition brought good money on ebay; I'm hoping for something similar! I thought about selling the pages of this French dictionary individually, but that just seemed wrong since the book was in good condition. Someone else must have thought so too; it sold quickly. Bright, vibrant graphics on this "Storm King" sheet music. This blue excavator has been in my son's room since he was little. We used vintage trucks to decorate, since that was his thing back then. Not so much anymore, so off it goes (don't worry, there are plenty of others). 336. Antique French Dictionary Book Heath 1000+ Pages SOLD! I didn't list much by way of Christmas this week -- mostly this lot of vintage snow flake (and other) boxes; two have sold. 108. Vintage Christmas Mica Snow Flake Box Penguin SOLD! 110. Vintage Christmas Snow Mica Flake Box Box Graphics SOLD! I am behind on my weekly updates but not on my daily listings! Let's catch up with Week #47 of The Etsy 365 Project. This little aqua teapot is so cute. Too bad it's missing its lid. But still! Sweet little Brownie Starflex camera and flash in its original box. And how adorable is this little Boston Terrier (?) figurine planter? 330. Vintage Banner Haddonfield New Jersey Pennant SOLD! Got my Christmas listing mojo back this week and was able to put up a lot of old inventory. The color wheel was one of the few "new" items listed. This blow mold Santa is a cookie jar! Adorable little set of wooden angel ornaments, made in Japan. Those dang elves are everywhere! This one is a door hanger. 100. Vintage Reindeer Figurine Porcelain Japan SOLD! More clocks and cameras listed this week on The Etsy 365 Project! I especially like the face on this one. It's dated 1931, and made in Canada. A Brownie Reflex camera, from the 1940s. A Polaroid, from the early 1960s. Anybody know a "Betty Anne" who would enjoy this tin? 317. Vintage Kodak Duaflex Camera Kodet Lens SOLD! I slacked off a bit with the Christmas listings -- only listed one item, but what an item! Styrofoam, glitter, and mercury glass vintage kitschy craftiness at its best. Sold within minutes of my posting to Facebook! 098. Vintage Christmas Tree Craft Handmade Unique SOLD! Wow -- things are starting to fly out of my Etsy shops! I sold some big stuff -- a vintage aluminum Christmas tree that went to Canada; some heavy stuff -- both of these gorgeous framed in rounded glass religious prints; and some international stuff -- two cameras, one to London and the other to France. This game, however, has been languishing for months. I decided to sell the pieces individually instead of just one big set. Let's see how that works. I found a stash of cameras hidden underneath some Shiny Brites, so they were listed as well. A few nice pottery finds made their way into the shop too. This atomic-shaped mid century ashtray is a lovely combination of aqua and teal. This incomplete Lusterware tea set is a beautiful periwinkle blue and peach. My research of this luminous Waterbury clock led me to the haunting history of the "Radium Girls", of which I am now obsessed. Do you know their story? 312. Vintage Kodak No 2 Hawkeye Camera SOLD! I found a giant box of vintage blow molds at our school's annual Christmas bazaar. My volunteer shift hadn't yet started and fortunately I was able to scope out the yardsale section of the event. These elves (gnomes?) are almost all gone. The box also held snowmen and Santas. This pretty tablecloth by Fallani and Cohn sold quickly too. 092. Vintage Gnome Blow Mold Elf Blowmold Light SOLD 5! 096. Large Vintage Tablecloth Christmas Wreath SOLD! It's fast and furious now! We are in prime holiday shopping season so you know what I'll be doing these next few weeks. I'm curious as to what's going to happen on January 1, 2014. Will I be exhausted from the daily listings? Numb? Depressed? And more importantly, should I do it all over again? An undated set of framed child silhouettes. I always feel like I should remove the backs of framed items to try to find a date. But those old nails are so off-putting I never do. A gorgeous electroplated Victorian-era teapot. I love the patina and wouldn't polish it a bit. How about you? Rustic primitive blue wall hook. Handmade vintage illustration of the Sacred Heart. I barely had this gorgeous camera listed when it sold to the United Kingdom. A photographer friend wanted the other (#308) when she saw the posting go up on my Facebook page, so that's probably the quickest two sales I've made. Glad I found the hoard of cameras I had; the rest will go up next week. 308. Vintage Argus Camera C3 Brick Two Tone Tan SOLD! 309. Vintage Camera Kodak Junior 620 Six 20 Case SOLD! On to the Christmas shop. Here are a bunch of plastic reindeer picks. A pretty and sparkly plastic tree topper, made in Italy. I love the color and graphics of this old box of Christmas lights. The lights themselves look pretty hazardous! I found a few Putz churches and houses I had from last season. A few of them could use some TLC, especially this really large church. But it's musical, and I'm sure someone crafty will fix it right up. 080. Vintage Santa Snow Globe Shaker Mica Kitsch SOLD! 081. Vintage Reindeer Picks Gold Fawn Deer NOS SOLD! We hit item number 300 on the Etsy 365 Project this week! I can't believe there are less than 65 days to go. I love brown transferware and have a few pieces, although I don't know the best way to display it. So this one's listed. I also listed this huge soft green enamel tea kettle, even though I wanted to keep it. Our kitchen is yellow and red, and the green just doesn't work. Although I do love the color; maybe this is the impetus to get rid of the yellow and start a jadeite collection! I have a bunch of these Handwork Kunstlerschutz German animals and started listing them individually. This guy's my favorite. 297. Vintage Religious Print St. Therese of Lisieux Mary SOLD! Lots more Christmas stuff listed but I really, really need to list like five items a day to catch up on all of my holiday inventory before the retail season is in full swing. I have three of these adorable wreaths but am only listing two; the third has a reindeer without any antlers so I'll just keep that for myself! This Santa sugar container was originally part of a stacking set -- the creamer is his body -- his eye blinks when you look at it from a different angle. This red flocked Santa, reindeer, and sleigh is complete in its original box. More kitschiness!